This thread is to compile the testing information for stock turbo control parts. I firmly believe that anyone can make their stock turbos run well if they thoroughly test everything under the hood and get it up to spec. The trouble is most people don't know how to properly test each component. It doesn't help that the Mazda FSM test procedures are incomplete or insufficient. (I can't imagine how many thousand$$ would have been saved in dealer bills if the FSM had more detail on this). My approach to the so-called "vacuum hose job" is to invest $100 in these tools, another $50 in spare solenoids. Then test everything and reassemble with new vacuum hoses and only the solenoids that work perfectly. You can find links about the hose job in the FAQ. Please give me the weekend to finish most of this thread before adding questions and stuff. Last edited by dgeesaman; 11-22-08 at 03:29 PM. First, the tools I use for testing. 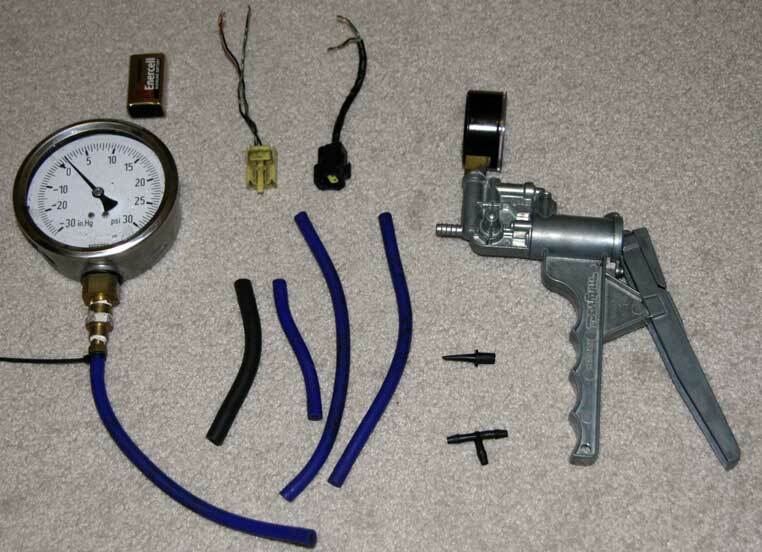 1) Mityvac vacuum pump kit. Get the Silverline Plus version because it has both pressure and vacuum readouts on the dial. 2) Extra vacuum hose. I prefer silicone because it's extra stretchy and it seals really well. 3) Tee fittings. McMaster-Carr has these under "tube fittings"
4) A 9V battery. The solenoids usually work pretty well at 9v versus the normal 12v, and I figure it's a more conservative test if the solenoid coils aren't energized to their full potential. 5) Connector pigtails I got off of a trashed wiring harness. This makes the electrical tests a lot easier. Not necessary but very handy. 7) An extra boost gauge can come in handy. Just don't bang it around like I did or else it won't zero out anymore. It will still work well if you compensate the readings by that amount. Last edited by dgeesaman; 11-23-08 at 07:54 AM. I don't have any spare actuators laying around, but those are easier to describe without pictures. First, I'll test the basic rack solenoid. In case you're not aware of it, a rack solenoid is a 3-way valve controlled by an electromagnetic coil. With no voltage, there is a spring inside that pushes the plunger into contact with one port of the solenoid and seals it off. When the coil is energized with 12v, the plunger gets drawn in the other direction, opening that port and sealing the other port. Said another way, each solenoid has a source port ("A"), a dump port ("C"), and an output port ("B"). When not energized, the solenoid shuts off A and sends C to B. When energized, the solenoid shuts off port C and directs port A (usually connected to vacuum or pressure source) through port B. The output B is usually sent toward an actuator, the source is either the pressure or vacuum tank, and the dump port is usually sent to atmosphere. In a few cases when a normally open logic is required, C is used as the source and A is dump. I lump all of the rack solenoids together because they are the same thing. The difference between them is only markings and the position of a filter if it has one. The filter is the black plastic thing with the polyester wool inside. You can pop them off and move them around depending whether the vacuum diagram calls out for one on that solenoid. My approach is to label each one and make up a chart noting the test results. I find that if I buy a full spare rats nest worth of solenoids, I have no trouble getting one full rack worth that pass the tests. Most of the rack solenoids switch between full engine vacuum (about 20-25in"Hg) and atmospheric (zero) pressure. The turbo control pressure solenoid operates between pressure and atmospheric. The most common failures are leakage of the plunger at one or both positions, a bad coil, and simply getting stuck. Some of these will happen only when the solenoid is hot, so I do each test cold and then repeat them with the solenoids hot. I do this carefully by heating the oven to 250F with the solenoids on one of those insulated cookie pans and covering them all with foil. About 10min in a warm oven gets everything nice and hot. I only take them out a couple at a time for hot tests because they cool off quickly. You can find info in the FSM about testing this type of solenoid on page F-177. Basically it says to check for continuity over the electrical coil, and to use 12v to ensure the plunger moves inside the solenoid. Use your multimeter and test the resistance across the terminals. It should be about 40ohms, or a little more if the solenoid is hot. If it shows a resistance above 60 or below 30ohms, junk it. Apply full vacuum (25") and full pressure (15psi) to port A. If it leaks (slow leaks are not acceptable to me), junk it. If it passes the vacuum test but not the pressure test, you can still use it anywhere except the turbo control solenoid. 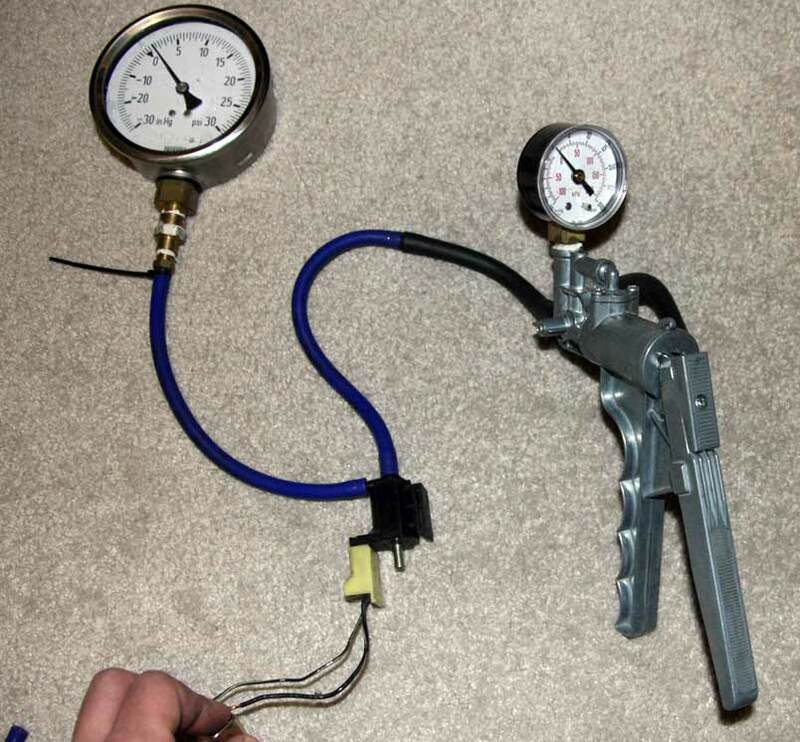 Set up like this, using your spare boost gauge or some other way to close off the output port B of the solenoid. Just a section of hose with a golf tee in the end will work if you don't have a spare gauge. Connect the power source to the solenoid. It should click open immediately, and release immediately when the power is removed. I find that sometimes a solenoid that's been sitting on the shelf can stick, so you can give it a good rap and see if that gets it moving again. If a few taps doesn't get it moving freely, junk it. If you think you freed up a solenoid like that, let it sit and try it again tomorrow to be sure. Thanks, Dave. How do you find the time for this stuff? Don't you sleep? I haven't needed this yet, but you never can have too much good info. Thanks! this is very good info! Do you feel the need to heat up these pieces in a toaster oven prior to testing? We have been doing that at our garage for some time now, to get them to an "operating temperature" such that they would see inside the engine bay. guys we all know this thread will be awesome but please lets keep our comments until the end of the write up.. Check valves are easy. You hook up the mityvac to the "back" of the valve (noting the arrow pointing "forward") and apply at least 25in vacuum. If it leaks, junk it. 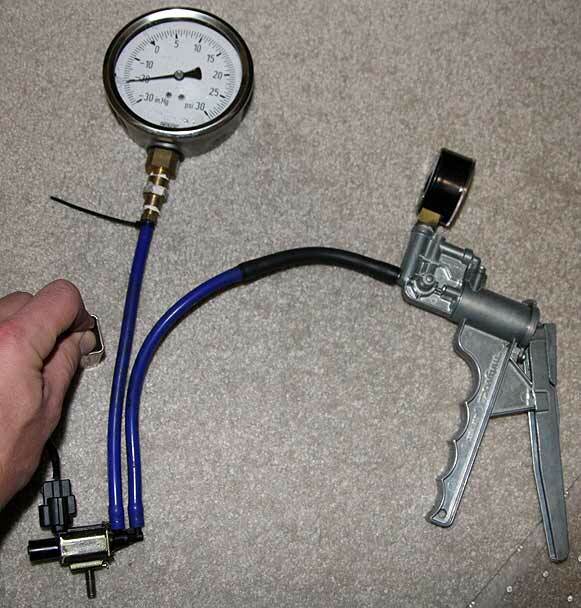 Then switch your pump and make sure it takes less than 1psi to slowly draw air through. If it takes more than 1psi to crack open, junk it. Or hook up the mityvac to the "front" and apply 15psi pressure. Max cracking pressure should then be about 2" vacuum. FSM covers this on page F-90. Last edited by dgeesaman; 11-23-08 at 07:18 AM. These are on/off solenoids, mounted as a pair. If one fails you pretty much have to junk them both. Fortunately they tend to last longer than some other solenoids. They act as a boost control solenoid, with pressure from the wastegate or precontrol actuator always on port A. The ECU rapidly pulses 12v to the coil and causes it to open and close rapidly, keeping the pressure in the actuator about 4psi less than what is coming in from the turbos. The FSM covers this on page F-93. So start by applying 12psi pressure to port A. Junk it if it leaks. Then use the 9v battery to test that it opens under 12psi pressure. It should open immediately. Last, check the resistance across the coil. It should be about 30 Ohms. 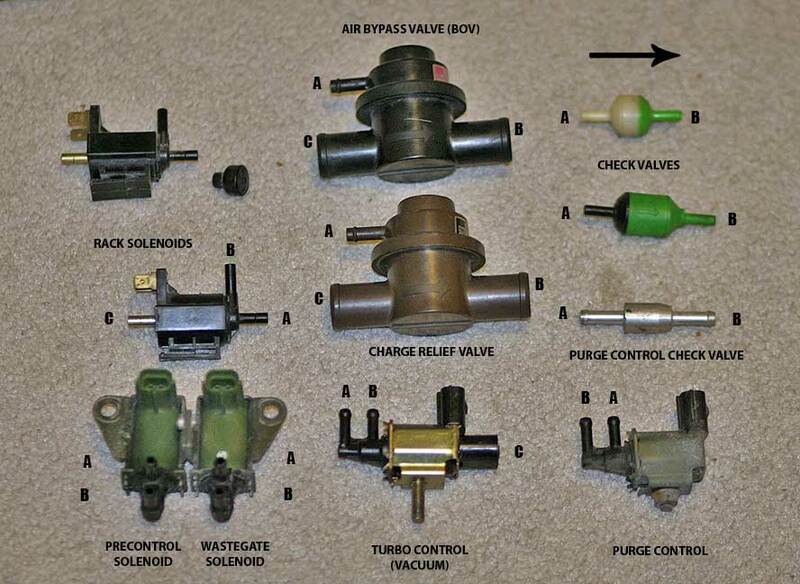 The purge control solenoid is an emissions thing. If you are having turbo control problems you might choose to skip this solenoid. It operates just like the wastegate and precontrol solenoids except that it's under vacuum. Hook up your vacuum pump to port B and apply 25" vacuum. It should not leak and it should open when you apply voltage. This is the solenoid that mounts onto the ACV. It looks like a purge control solenoid but it's not the same thing. That plastic cap on the end actually covers the dump port (pull it off if you're curious), at which point you can clearly see this is a 3-way valve. It operates by switching vacuum. It opens and closes exactly with the turbo control (pressure) solenoid in the rack, in fact the wiring joins within the harness and is controlled by one pin on the ECU. One applies pressure to one side of the actuator, the other applies vacuum to the opposite side. I suspect this is because the spring in the actuator is much stiffer than the others. Set up like this, with a dead-end on port B and your vacuum pump on port A. Just like a rack solenoid, test to see that it does not leak with 25" vacuum. Then energize it and see that it opens cleanly and again the vacuum does not leak. Coil resistance should be about 37 Ohms. There is no coverage for this solenoid in the FSM. I believe Mazda added it at the last minute to improve the response of the turbo control actuator. The ABV and CRV work like blowoff valves. The ABV is a true blowoff valve, opening only when there is vacuum at the intake plenum. This way when you let off the throttle under boost, the butterflies close and you have vacuum on the engine side and full boost still being produced on the intake side. That's like slamming your spinning turbo into a brick wall; so by opening the ABV that boost vents off into the airbox and allows the turbos to spin down gracefully. The FSM covers ABV testing on F-77. The CRV is a little different. It operates by giving boost somewhere to go (the airbox) when the secondary turbo is in the pre-spool state. It closes when the secondary goes online at 4500rpm. If the CRV does not close fully you can see loss of boost above 4500rpm. The FSM covers the CRV testing on F-88. 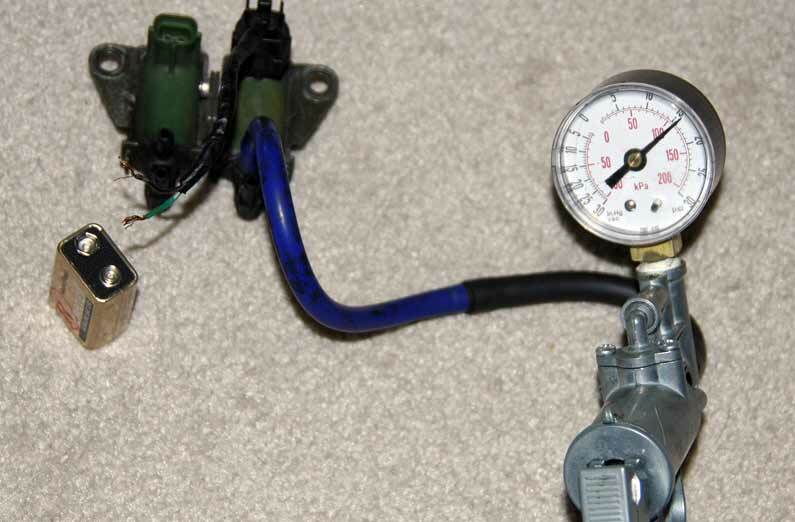 Testing is pretty simple: hook up your vacuum pump to port A. Apply a small amount of vacuum (7 to 9 inHg) and you should hear a gentle pop as the valve opens. Junk it if it doesn't open and close crisply. Ideally you should also hook up the vacuum pump to port C and apply 15psi of pressure with a check valve in line. Junk it if it leaks. 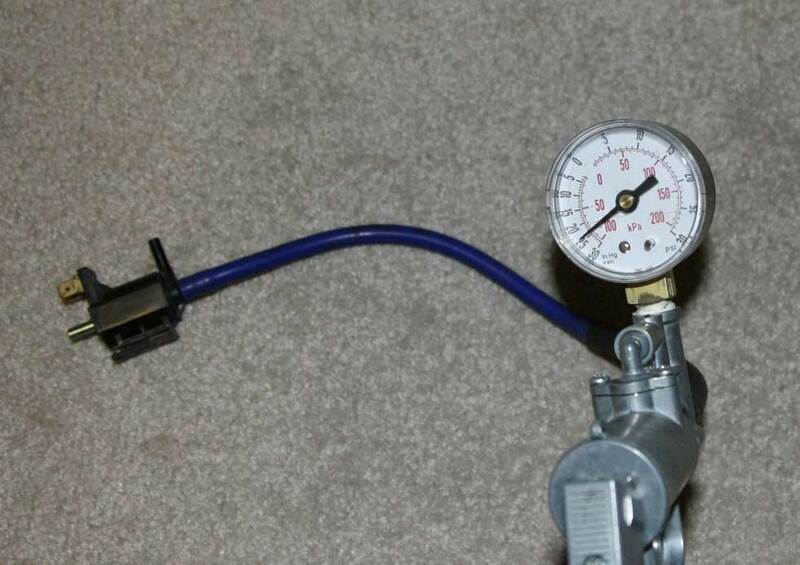 Then you can disconnect the pump at the check valve, leaving 15psi still applied to port C. Now apply 7-9inHg at port A, and it should snap open and vent the pressure. Unfortunately I haven't put together fittings that will adapt from that large opening on port C to my vacuum pump. Last edited by dgeesaman; 11-23-08 at 07:59 AM. The other actuators are pretty well covered by the FSM. I basically use the vacuum pump to apply whatever amount the FSM says it take to open the actuator. If it leaks I junk it. If it doesn't move smoothly I junk it. No pics because I don't have spare actuators laying around. The actuators have bigger vacuum lines than the solenoids. I have an adapter fitting that jumps from the small vacuum hose to the larger size and this helps me get a good leak-free test setup. (Note, you don't have to do both a vacuum and pressure test on this one, just one or the other). Last edited by dgeesaman; 11-23-08 at 08:00 AM. Yes, I have found solenoids that pass when cold and fail when hot and vice-versa. So I do all tests hot and cold. I use a regular oven and one of those "air bake" cookie pans. I don't trust a toaster oven. Ha, not quite. I'm limited to just a couple of attachments per post, which is why it has to be a thread. There is another step necessary to check the pressure side of port C. The key (as indicated above) is to determine if the "C" opening will hold the maximum boost when closed, and if the passage "C" to "B" is open when vacuum is applied to "A". While the test correctly discusses the vacuum to "A" issue, what is missed is that, during normal operation, when the CRV is closed, pressure is being applied to "A". Therefore, to test the CRV, put a T on your mityvac line and apply pressure to both "A" and "C" simultaneously. I've never seen a CRV that would hold 15 PSI on "C" without applying pressure to "A" and many people have needlessly replaced their CRV when it was actually working perfectly well. For testing "C" my vacuum/pressure pump/gauge came with a neat adapter that looks like a bottle cork on one end (fits tightly into "C") and has a regular tubing connection on the other end. PS. Great idea to put this all in one thread as you usually need to test all this together to really trouble-shoot boost problems! Last edited by jmadams74; 12-02-08 at 10:46 PM. Nice writeup. Another good power source for testing solenoids is an old PC power supply. Turn on the switch and you've got an instant +12v (and +5v) on any of the connectors for powering the hard drives. ooh.. brilliant!, i hadn't thought of that! I may just have to set up a test area for solenoids with my old power supply! Hopefully this will help me get an intermittent boost issue solved, and the idle problem i've been having. Last edited by squealy; 12-03-08 at 09:58 AM. FWIW, I had a 50% failure rate on NEW from Mazda OE solenoids. In short, test them even when new! Seems like this thread belongs in the Archive section.